Wow! What a great conference weekend we had at the Annapolis Basin Conference Centre! 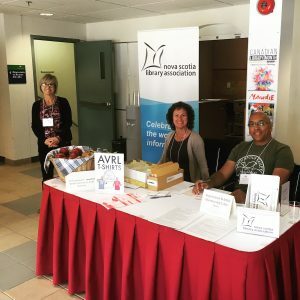 The 2017 joint Nova Scotia Library Association and Library Boards Association of Nova Scotia Conference – “Libraries 150: a celebration”– was hosted by the Annapolis Valley Regional Library and held September 29th-October 1st. Library staff and board members from across the province participated in professional development workshops, opportunities, and networking that will compel us to move forward, do better, and keep learning. Workshops ranged from Library Advocacy to Puppet Storytime, Treaty Education to Coding, and everything in between. Thanks to Libraries 150 funding, a public component was part of the conference. 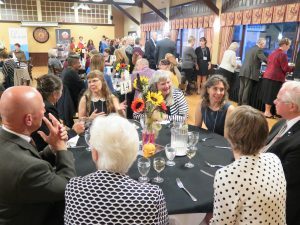 Readings and presentations by authors Ami McKay, Wade White, Jon Tattrie and Lance Woolaver, as well as the One Book Nova Scotia winner Gloria Ann Wesley were open to the public by pre-registration. The Friday night reception with Ami McKay was enjoyed by all, and the showing of the movie Maudie (also open to the public) on Saturday night in the ABCC theatre was a highlight. The conference offered 22 sessions with over 40 guest presenters to over 160 registrants. The 10 exhibitors, and our many conference sponsors helped make this an excellent professional development event. If you’d like to see some of the conference in action, visit our online photo gallery. We were honoured to have Leo Glavine, Minister of Communities, Culture and Heritage as guest speaker at the Saturday evening banquet. Awards were given to deserving recipients. 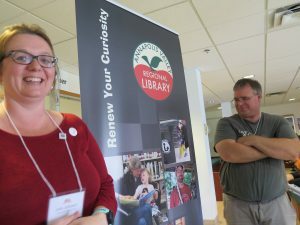 Faye MacDougal, Chief Librarian of Cape Breton Regional Library, received the Norman Horrocks award for library leadership; and Doug Vaisey of the Board of Halifax Public Libraries received the Library Boards Association of Nova Scotia Trustee Award. The hospitable facilities staff, delicious food, and the scenic location were added bonuses to an engaging weekend.